Outfits is the first screen you see when you open the StyleShoots iPad app. It's shows all the Outfits you have captured but haven’t exported yet. Each outfit shows an overview image of what the model is wearing. Circular thumbnails show each tagged product along with indicators of how many videos and photos are in the Outfit. 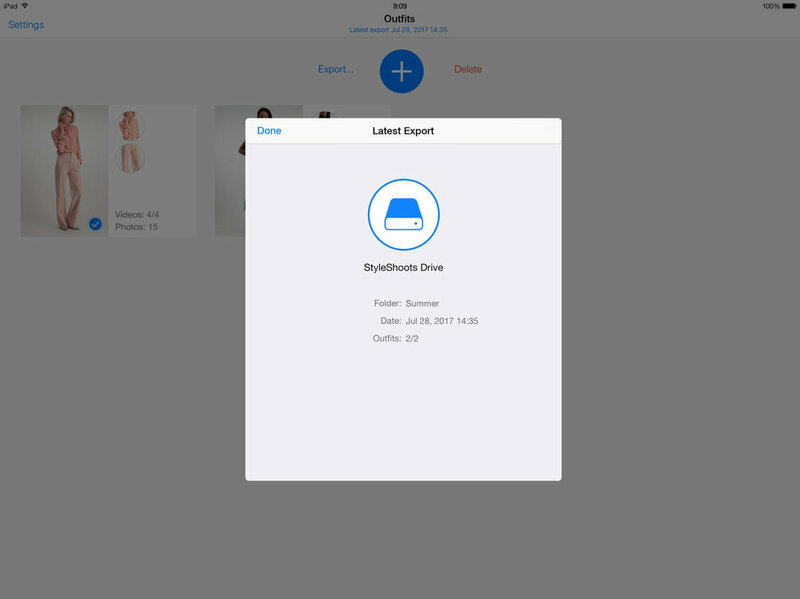 Before exporting, your can review your Outfits and delete the ones you don't want to keep. Once you are happy with all your videos and photos, you export them. Note: When your outfits are exported, they leave the Outfits screen and are no longer visible in the iPad app. Tap the outfit you want to view. This takes you to the Composer screen. In Composer, you can review all the videos and photos within the outfit. You can choose which outfits to export, and which to discard. NB: Deleting an outfit will permanently delete all photos and videos within that outfit. In the Outfits screen, tap the Check Mark icon of an outfit to toggle it into a Delete icon. If you change your mind, just tap the icon again. Once you've marked all the outfits you want to delete, tap Delete at the top of the screen. A popover shows you all the content that is about to be deleted. Slide to permanently delete. The outfits are now discarded. To export your photos, tap Export at the top of the screen. The Export Panel will open and let you select a storage volume, a destination folder and which presets to generate. In the Export Panel, choose a target volume. You will now see a list of the folders in your selected volume. Pick a folder or enter a create a new one by typing in the New folder... field. To change which Presets will be created, tap the Video Presets or Photo Presets rows. Tap Export to start the export process. Tip: You will only see volumes that are currently available. If you see no volumes at all, try inserting another USB stick into StyleShoots. The Export Status panel shows you a live status of the export progress along with key info like amount of files and number of export presets selected. To stop an ongoing export, tap Stop Export. Ongoing outfits will be finalized, and the rest will be put back in the Outfits screen. Tip: You can always see info about your latest export. Tap Latest export [date] at the top of the Outfits screen, and a panel will show you all the key info. 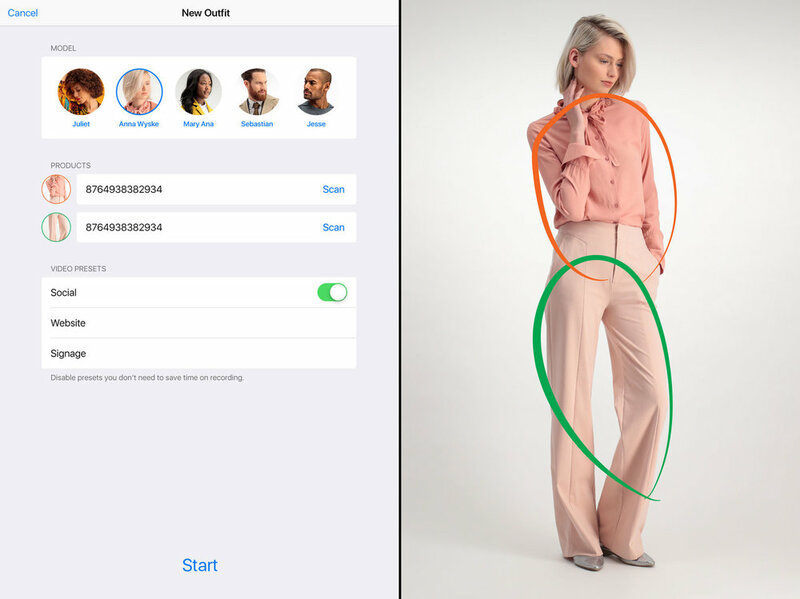 Tap the Plus button to create a new outfit. Have the model stand in a neutral posture and tap the Photo button. Select a model. If the model is not yet in the system, you can add a model in Settings. Draw loosely around each product you’d like to feature in the Outfit. If you want to re-draw or delete a product, swipe left on the product row to delete. 5. Type a name for each product, or scan a barcode by tapping Scan. 6. Choose which Video Presets you want to use for the Outfit. 7. Tap Start to enter Outfit Composer. Tip: If you are shooting a series of pants and the model is wearing the same top, you might want to only mark the top in one of the outfits. This will save time and avoid duplicate content.